The last thing Katherine O’Brian needed when she hopped out to satisfy a late-night snack attack was to come upon a murderer. Not only is her life now in jeopardy as the crime’s only witness but her heart is traversing some pretty dangerous territory as well in the romance department. 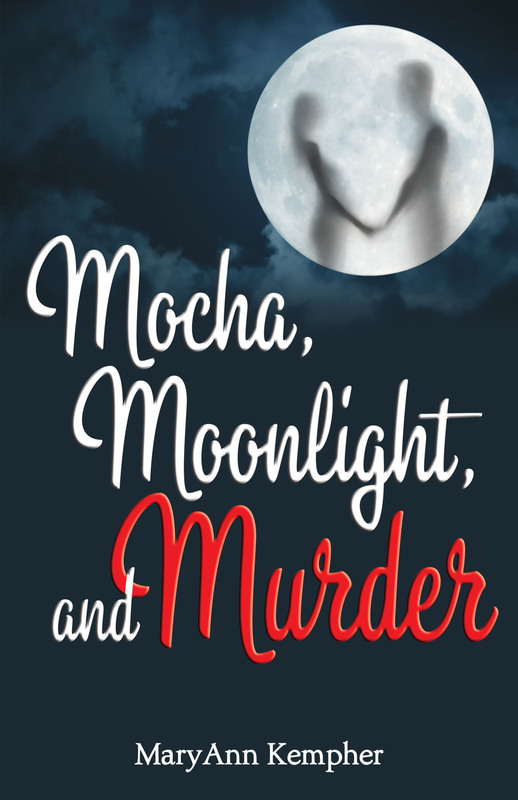 First-time author MaryAnn Kempher draws upon many aspects of her real-life passions and her familiarity with Reno (the story’s backdrop) to craft Mocha, Moonlight and Murder, a romance suspense that has recently been published through Booktrope. The debut novel did very well for September, reaching #97 on Amazon’s Top 100 and #4 in both Suspense and Romantic Suspense. I haven’t read this book, but you may see samples of it on her website (http://mkempher.com/) and on Amazon (http://www.amazon.com/Mocha-Moonlight-and-Murder-ebook/dp/B00CD4AYVG/ref=sr_1_1?ie=UTF8&qid=1380897693&sr=8-1). Q: Your debut novel, Mocha, Moonlight and Murder, follows the story of twenty-something Katherine O’Brian as the accidental witness of a brutal murder, and Scott Mitchell as the somewhat reluctant partner in anti-crime, working alongside Katherine to help her solve the murder before the killer can keep her quiet. When and how did this story first come to you? A: Oh wow, this story evolved. It actually started out as a story about insurance fraud. It’s hard to say how a character or story develops; they do kind of take on a life of their own! Q: Was there a particular character that surprised you? A: Katherine just came to life for me. She doesn’t take any grief from anyone yet isn’t nasty about it. She and Scott—I can easily imagine sitting in the mall by the skating rink drinking coffee with both of them. Probably guarding my food from Scott. Q: It’s cool how our characters become so familiar to us. Blending romance and mystery in Mocha, Moonlight and Murder, how did you approach the pacing and unique flavors of each genre so that they would complement each other? A: “They” say write what you like to read. I like romance, but not too graphic, and I really enjoy reading a good mystery. I like books that are fast paced, so I tried not to let too many pages go by without something happening that moves the story along, either with suspense, romance, or humor. I wanted a nice balance of romance and mystery. Though I think it’s more romance than mystery, my readers have said they love the mystery element and the unexpected ending. Q: Yes, and they also say write what you know. You set the story in Reno, Nevada, where you spent many of your teen years. How did having that shared background help ground the story, when you were building up that world? A: Oh, the park and the malls, the casinos, etc… are all real. These are places I went to, for instance, Virginia Lake. I used to live just a few blocks from there. Knowing the city so well, made it easier to write about places the main characters visited. When Katherine and Scott go somewhere, I can picture the location in my head—because I went there, too. Q: I’m sure that kind of detail would come through. On your blog you shared a photo of your workspace. Please share with us your writing process and routine. A: My youngest daughter, 13, leaves for school at 8:30. After she’s gone I usually go bike riding about 4 miles for exercise. I love doing this because I plan out in my head different scenes that need tweaking, or need to be written. When I get home, I clean up, get myself a large coffee and sit at the computer. J I don’t necessarily write, though. I surf, Facebook and my email. I stall. Finally, I open my current work in progress and start writing. Some days, I write a little, other days a lot. Q: It’s interesting to learn the different ways people write best. Why do you write? A: There is such satisfaction when you’ve written a scene that works, or dialogue that rings true. Writing is hard work, but on a good day—when the words are flowing—it’s the best feeling in the world. Q: Yes, and writing is just one part of the whole process involved in bringing a book into the world. You published Mocha, Moonlight and Murder through Booktrope. What was the most challenging aspect of this process, and what has been the most rewarding so far? A: The most challenging? Having patience. Everything in publishing seems to move along at a snail’s pace. For instance, I didn’t hear back from Booktrope until eight months after the book had been submitted. So, if you’ve written a book, just know that nothing happens overnight. The most rewarding? The expression on my daughter’s face the first time I showed her a hard copy of my book. I dedicated my book to both her and my son. My family has given 100% support for my writing dreams since I first starting writing Mocha. Q: It’s wonderful when you have family like that. You mentioned on your website bio that Jane Austen and Agatha Christie are among your favorite authors. What draws you to their stories? A: I love the witty banter that Jane Austen wrote between her characters. I tried to recreate that between the characters in my book. Regarding Agatha Christie, well she’s the queen of the mystery novel. Her books are still selling well. Her characters are always interesting, and she keeps the reader guessing, without being too tricky. I love her Hercule Poirot books. Q: Mystery and romance usually have strong character stories, and frequently are series books, so your blend seems well matched for the stories you admire and look to write. You have a sequel to Mocha, Moonlight and Murder planned. What else is next on your plate? A: Book three, of course! Q: As a new author, what do you know now that you wish you had known at the outset of writing your book? A: Oh wow, great question. I wish I’d done more research. I tell people who ask: go to the library or the bookstore and pick up some books on how to write in the genre of your choice. Also, how to write the beginning, middle, and end. Sure, you can just sit down and start writing, but if you educate yourself a little first, it will save time in the long run. Q: Good advice, thank you. Where can readers find you? If you’re a reader, be nice. Even the books you don’t like are some author’s “baby”. If you’re a writer, hang in there, trust your instincts, and don’t settle.